While teeth are remarkably strong, there are many ways that they can become damaged. For instance, biting down on something hard, including chewing ice can cause teeth to chip. Trauma from a car accident or sports injury can certainly cause damage. In turn, cavities can weaken teeth, causing them to fracture or break. Whatever the case, advancements in dentistry provide many options for repairing damaged teeth. To repair chipped, cracked, or broken teeth, Dental Composite Bonding involves placing putty on the tooth (after it is roughened and conditioned). An ultraviolet light is used to harden the putty. Next, it is shaped and polished to match the shape and color of the patient’s natural teeth. Bonding can last up to 10 years. Veneers are a realistic and cosmetically pleasing option for covering one or more teeth. Patients can choose how their veneer(s) will look, and with good oral care, they can last up to 30 years. Many people experience pain while chewing after their teeth have been damaged. This is usually due to severe chipping or fracture. Thus, a Crown, or “cap,” is a widely used restorative treatment that covers and protects teeth. For a more natural look, crowns can be tooth-colored or porcelain. Sometimes, a crack in a patient’s tooth extends to the root, or pulp. In this case, the best treatment is often a Root Canal. 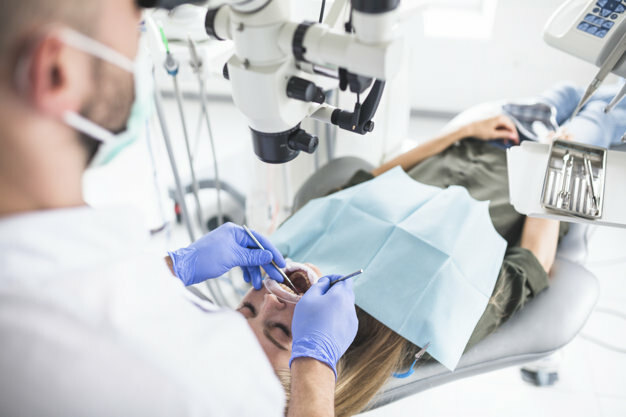 Though this procedure has a bad reputation for being painful, patients should feel no pain or discomfort when they visit a skilled dentist. During the Root Canal treatment, the decayed portion of the tooth is removed, as well as the nerve. It is then sealed to prevent further infection. When damage to teeth is severe, reaching below the gum-line, the tooth will most likely need to be removed. While this may be concerning, patients should know that Dental Implants are a wonderful option for replacing missing teeth. Essentially, the implant will become the tooth’s new root, resting securely in the jawbone. At Smile Avenue Family Dentistry, your oral health is important to us. If you are concerned about your teeth, or if you suspect that they are broken or chipped, please call us today. You’ll feel at ease with the compassionate care at Smile Avenue Family Dentistry.